After months of anticipation, Beyoncé and husband Jay Z finally kicked off their "On The Run" tour in Miami! Music's biggest power couple performed to a sold-out crowd at the city's Sun Life Stadium, and Bey didn't disappoint with her stage looks, which ran the designer gamut from Versace to custom Alexander Wang to Elie Saab. If you're lucky enough to have scored tickets to the duo's 16-city tour this summer, you'll be able to catch a glimpse of these outfits up close and personal. And Bey is known for rolling out new costumes through her tours, so we're sure there will be more splendor to behold. Scroll down to see our favorite Beyoncé looks from the couple's tour debut! Queen Bey paid homage to her much-discussed, Nichole de Carle-designed Grammys stage look in this black sequined fishnet Atelier Versace bodysuit, which she wore to open the show. 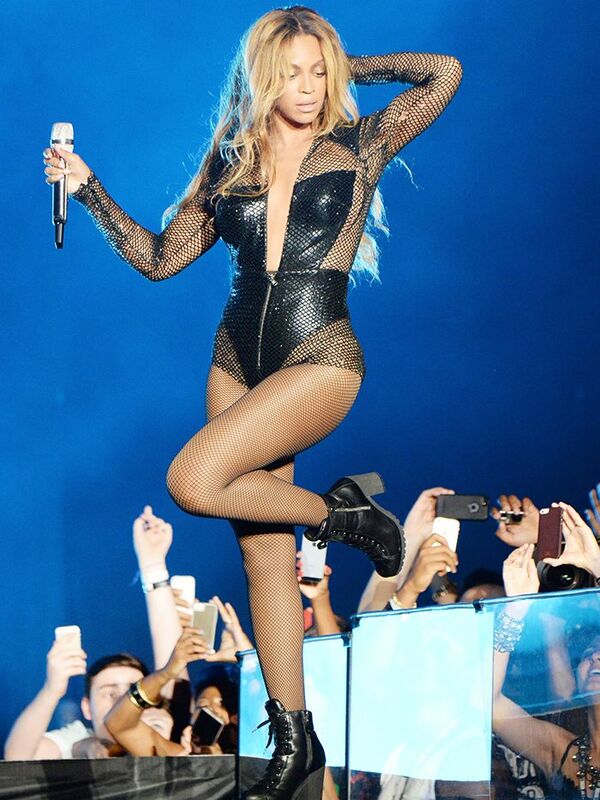 Beyoncé doing what she does best, in custom Alexander Wang. A Versace bodysuit and a turband made for a powerful combination. If there's one human who can pull off a custom denim onesie by Diesel, it's definitely Beyoncé. A sparkling full-length bodysuit is one of Beyoncé's go-to stasge looks. A bit of a patriotic moment in a bodysuit with a stars-and-stripes train. A mesh cutout proves that Bey is quite proud of her abdominal region. If we were Jay Z, we'd probably have a big smile on our face, too. For one section of the show, Beyoncé put on a wedding dress-inspired Elie Saab bodysuit. Queen Bey is known to rock a cape from time to time, and this is her latest effort at the look.